McAlister's Deli's nod to the fall includes the new Turkey Cranberry Sandwich and Autumn Squash Soup. 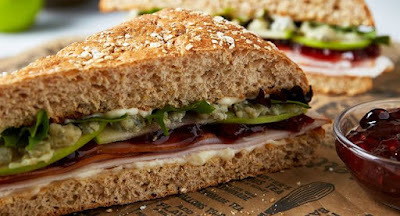 The Turkey Cranberry Sandwich features mmoked turkey, cranberry compote, thin-sliced Granny Smith apples, Gorgonzola cheese, mayo, and spring mix on toasted 9-Grain bread. Autumn Squash Soup is a creamy squash soup with hints of cinnamon, cardamon, rosemary, and maple, topped with a swirl of sour cream and a sprinkle of honey-roasted almonds. Both items are available at participating locations for a limited time.